I’m willing to bet that most of you have drunk a smoothie out of a cup, but have you ever eaten a smoothie out of a bowl?! Smoothie bowls are a newer breakfast trend that many people are finding extra delicious. To create a smoothie bowl, you will still need a blender. You blend together several ingredients to create a thick smoothie. 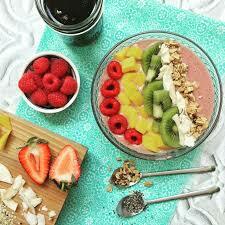 You pour the smoothie in a bowl and then top it with a variety of toppings. Topping may include things like fresh fruit, veggies, nuts, seeds, shredded coconut or granola. You eat the smoothie bowl with a spoon just like you would a bowl of yogurt or cottage cheese. Just like regular smoothies, smoothie bowls come in a large assortment of flavors. Pretty much any regular smoothie can be turned into a smoothie bowl. After a quick Internet search, I found hundreds of recipes. There were recipes for a green smoothie bowl, an acai berry smoothie bowl, a chocolate hazelnut smoothie bowl, an avocado cream smoothie bowl, a carrot cake smoothie bowl and so much more! So next time you fire up the Blendtec, try eating your smoothie out of a bowl. Toppings can only make it better, right? Enjoy!